One of my favorite hobbies is spending time crafting and doing unique projects. When I was a little girl I used to enjoy seasonal craft projects with my Grandma’s cousin, Becky. Becky and I would go to Hobby Lobby or Jo-Ann Fabrics to shop around for hours picking out the perfect supplies for our unique seasonal gift for each of my relatives. From reindeer candy canes to fancy personalized wreaths to Christmas tree ornaments, we never failed to put our creative minds to work. Man, how I miss those days! But with an extra chilly breeze outside and Christmas music playing in my room on a Sunday night, my urge to relax and put my creative hat on kicked in! I ran to the pub in the student center with a cute idea in mind, crossing my fingers that St. Lawrence wouldn’t let me down in carrying Nabisco Nutter Butter Bites and Hershey’s Kisses. 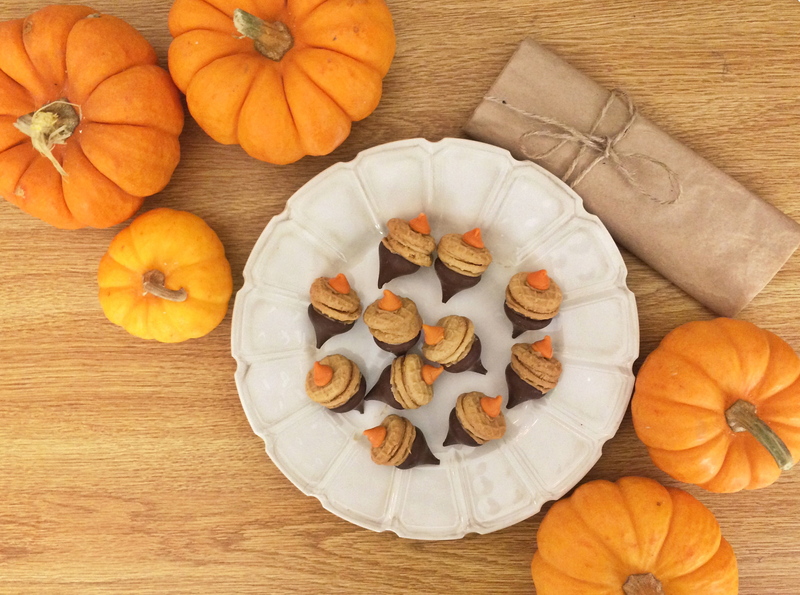 With the addition of some peanut butter and specialty pumpkin spice morsels I really had a blast making these creative treats. Whether you are babysitting and need a fun activity to do, or just want to make an easy, festive treat for you and your friends, I guarantee these cute acorns will please just about anyone! Take each nutter butter and spread a little bit of peanut butter on it. Top with a hershey kiss. Then put a dot of peanut butter on the bottom of a pumpkin spice morsel and place that on the other side of the nutter butter. Bon appétit!